Thank you for coming, Inktober is now finished. Below you can see my journey through each day as I persisted on creating a single piece every single day of the month. Lock, Shock and Barrel are fantastic characters to draw. It's liberating to draw characters without pinky fingers due to their western nature. It really is easier to make three fingers work in general. Another thing I love about every nightmare before christmas character is just how varied their anatomies are, every single aspect of each character is drawn as an extension of their persona rather than just the shell the carries it. It's finally over too! I actually did 31 drawings throughout, and I'm glad I did. Some pieces I wanted to spend more time on, and pretty much all of them left me wanting to do more to them, but ultimately I learned that sometimes you just have to call it and move on, which is something I've never forced myself to do before (hence the reason the Manga isn't out). I did leave the experience with a plan for getting it all done and out there though, and the support I've received on the journey has been fantastic! Till next year, I'm back to working on Imitation Dei and the Webcomic! 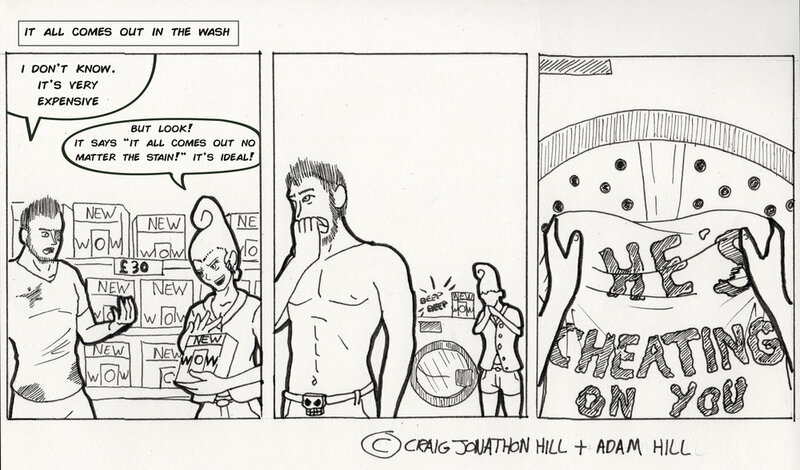 I've decided that the chill method comic is going on a break next week. It's safe to say that doing Inktober has been fantastic and fun, but I am really exhausted, and I want to keep at least a little bit of sanity once all is done with it all. The comics are always the toughest to do well traditionally for me, because of how small and fiddly the panels are to plan out... I really miss digitally drafting and resizing things. I have no idea why the camera chose this particular session to fail. I tried everything to recover the footage, but there was nothing I could do. Either way, the art survived, and I know I'm happy knowing that this wasn't lost at least. Man oh man, it feels weird to see me at 28 inktober images now. Pretty soon it'll be back to Imitation Dei based work, and I've got a renewed fire with it all. Really tempting to play a whole lot more Mario Odyssey instead, but I need to resist its temptation otherwise I'll never finish what I start with my artistic passions in life. Was just after drawing the climb prompt today, but when looking at stock poses, I kept wondering if my character should be climbing an actual face... So since it's Frankenstein Friday, I may as well have his face in the image. I wasn't trying to revisit the whole viking thing, but like with the toad, I can't just draw an animal or character doing nothing at all. Since our hamster can be a bit of a pain, it seemed right to give her a warrior aesthetic. I don't know if all female hamsters have such random ups and downs, but this particular one is like a cat with how fickle she can be with her moods. It's getting easier to use illustrator. I've stopped taking 30 minutes though, it made more sense at this stage to really go to town on this one since it'll probably be the last vector of this 31 day journey. There is currently no compulsion to make a bottle ship in real life, but this was still fairly fiddly to do. I haven't played this game in a very long time, but I remember it well for being a very challenging experience. I at first considered technomancy for the hex after a few great suggestions, but as time passed I found myself just wanting to do this more and more. Nothing quite like a troubled young girl exacting her revenge against a man who cursed her to fight through her dreams every night... I'm tempted to pick this one back up. It's such a fun process to bring these ideas to life. Getting the gag to translate well is always a challenge with the size of each panel. You'd think with A4 I'd have plenty of room, but 3 dividing lines really does tighten things up a heck of a lot. If I were working digitally at the same size I could just keep re-working it, but traditional is all or nothing. I'm hoping that I can use what I learned this month to return to digital with some new tricks. I didn't think that we would actually improve as much as we have with these attempts at drawing to unknown. To such an extent that you can kind of tell what we were aiming for. We have these amazing cushions that you could practically frame, and this one is easily one of my favourites. It's a very playful image and yet deep and thought provoking. I'd be lying if I said I was happy with the result, but it's amazing just how hard it is to draw anything this expressive in 60 seconds. Pixar characters are made to look simple, but the amount of detail in any one model is mind blowing when you really take all of it in. I don't think i'll be so public with these challenges after inktober, but I have been considering getting a sketch book literally for the soul purpose of 1 minute sketches. I really am out of my depth (pardon the pun) when it comes to painting... so painting at speed... not exactly a fun experience for me, but one I really need to do a lot more often I think. Just to get those stress levels up I decided to only use blue too, as if it wasn't fiddly enough. Paints don't have much precision, especially digitally, so I find it really hard to relax with them and still get a coherent image out. I'm fairly certain I'm not the only one that decided to draw the FFVII legend himself. I'm probably one of the few that prefers squall though when it comes to Final Fantasy pretty boys. This was based on one of his starting frames for his dash in smash brothers wii u/ 3ds. Not actually really played smash in a while... wonder if it'll eventually get a switch release... I can dream. While unreleased, I've been playing with the logo on and off for quite some time. I'm also trying to add an accurate Japanese title too, but it's proving quite hard to do. One of the translations that pops up is Kami no Mane (which sounds about right), but I need a second opinion on it before I go ahead with that part. That said I think this design type would benefit from the Japanese text underneath if it did turn out correct. I really think that this particular piece was a great learning experience for animal drawing. At first I made the sketch underneath quite uniform, but I soon found that the more warts and bumps I gave him, the more I could get behind the overall look of the toad. The man's leg and the woman came later, but it helps give the toad a purpose on the page since I'm really not the type to draw characters doing nothing. Me and the brother really do leave it, until we're really close to each deadline to settle on an idea for each one of these. It's not the intention, it just seems to creep up on us every time. So far I'm yet to work on a strip that I didn't like or felt was rushed though. So that's a big fat plus! To say I can't see what I'm doing, I've somehow managed to make a vaguely good go of the pumpkin. The video also contains the last two days of week 2 as well, just so that you can see my process with those too. There was very little challenge with a no pencil lift, so I decided to make the tougher step of choosing to go with a medium tipped fine liner. You could say the experience was scary because of this... and you'd be right too! I really am impressed with the result though. I couldn't come up with an idea that I liked for this at first, I kept picturing mirrors and blades, and a lot of people had jumped on that. I wanted to do something a little more playful with the idea, and then Ginny (my wife) chimed in with a brilliant piece based around exhaustion and caffeine. Really wish I knew how to do gradients properly in adobe illustrator (the mouth effect in the end was added in good old photoshop). It's a really tough program to learn at times despite how simple the outcome. I love working with such a clean and mostly friendly interface, but there are parts where I just feel very out of my depth at least for now despite that fact. A few video tutorials more and I should be a pro... surely. Decided to go with both the drawlloween and the inktober theme today, as I liked the idea of making something from a worms eye view. Essentially we have an alien that has given up on finding intelligent life upon witnessing the flat earth movement. I'm really tired, and I hope it isn't showing too much in my art. I'm happy with the results either way. It's not easy being this consistent, but I'm still glad that I'm not letting anything stop me. Really quite impressed with how this turned out. I feel like both myself and the wife are getting a lot better at making coherent shapes despite having no idea what we're drawing at the time. We're slowly mapping out the page and that in itself is an important skill to develop. Not sure what differences there are between Dwarves and Trog's, but I do know that I'm pleasantly surprised that we could draw anything close to these in the space of a minute on our first tries. I might make a habit of these as they seemto be a healthier way of getting started with a day of art as well as disciplining necessary habits to be more on point. The wife recently bought me one of the more modern Bowie albums to add to my collection. I've found it to be much more interesting than I'd expected it to be since a lot of Bowie fans don't talk about it much. I love the "Bowie Decade" but there was a very different and reflective yet forward thinking feel to his later pieces. Ever the artist, he is a major a point of inspiration and fascination for me. As the title suggests, the below image was made without lifting the pencil from the page. 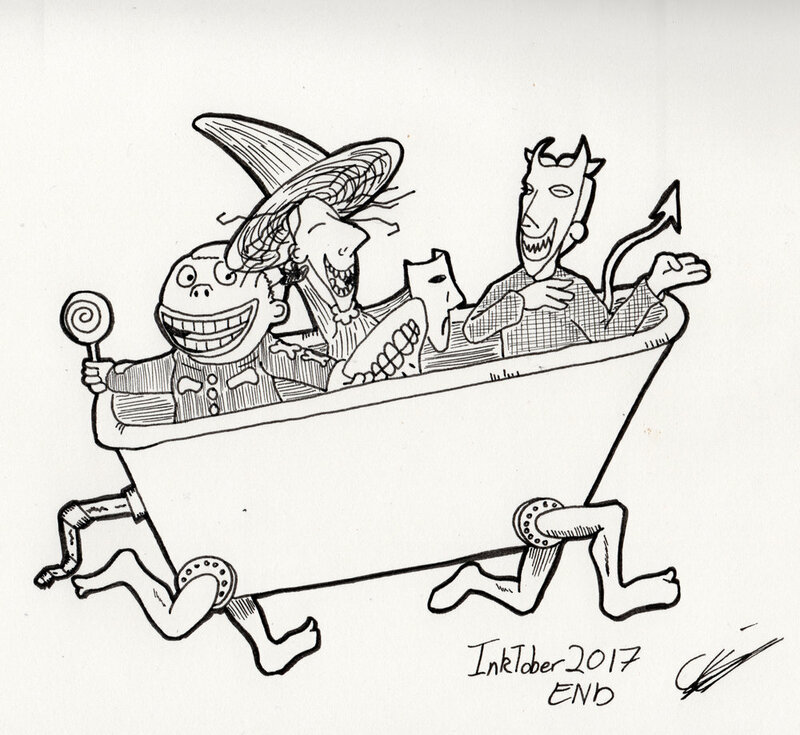 So this is actually one of the #inktober prompts. I'm becoming very much aware that I need to get better with my pen strokes, there's a slight wobble to my work which I think I correct a little too much using software when working digitally. It's one of the main reasons why you'll see a lot of these hand drawn traditional ink works. Less to do with the name of the months challenge, and more to do with self betterment. So, today I'm proud to announce the new logo done in less that 30 minutes, the screen recorder messed up so I failed to get the recording for this. I think given more time I would have played with more advanced vector tools instead of just basic pen and shapes. That said although I wasn't planning to do the logo, I just got the idea late last night and thought I'd make it challenging to kick the vision out in the space of 30 minutes for this days upload. Really struggled to think of something for today at first, my mind kept trying to be creepy and gruesome when it came to suggestions, but I had a feeling that it would be best to try stepping outside the box and playing around with the concept a little more. In the end I liked the Tombs part being plural and went for a young married couple whose love is eternal. It's strange to think that this is the first comic since starting the site that has Chill in it. All the others have been spin offs. With Adam on board as the writer, everything has taken a very interesting turn and surge in quality. It's sunday, and I've always appreciated treating this one day as a day unlike the other 6, and so I immediately wanted it to be a blindfold challenge. A theme that may actually continue even after this month is over.